(269) F. Nomura, T. Tanabe, Takeo Ohsaka, T. Gunji, F. Matsumoto, Optimization of Calcination Temperature in Preparation of a High Capacity Li-Rich Solid-Solution Li[Li Ni Co Mn ]O Material and Its Cathode Performance in Lithium Ion Battery, AIMES 2018, 2018.10.1-4, Cancun, Mexico. (268) T. Tsuda, N. Ando, T. Tanabe, K. Itagaki, N. Soma, S. Nakamura, N. Hayashi, F. Matsumoto, Improvement of High Rate Performance of a Lithium Ion Battery Composed of Laminated LiFePO4 Cathodes/ Graphite Anodes with Porous Electrode Structure Fabricated with a Pico-Second Pulsed Laser, AIMES 2018, 2018.10.1-4, Cancun, Mexico. (267) F. Ando, Toyokazu Tanabe, T. Gunji, S. Kaneko, T. Ohsaka, F. Matsumoto, An Electrochemical Dealloying of Ordered Intermetallic Platinum-Lead (PtPb) Nanoparticles Supported on TiO -Deposited Cup-Stacked Carbon Nanotube for Highly Efficient Catalysis Toward Oxygen Reduction Reaction in Acidic Media, AIMES 2018, 2018.10.1-4, Cancun, Mexico. (266) 安藤風馬, Effect of the d-Band Center on the Oxygen Reduction Reaction Activity of Electrochemically Dealloyed Ordered Intermetallic Platinum−Lead (PtPb) Nanoparticles Supported on TiO2-Deposited Cup-Stacked Carbon Nanotubes The 28th Annual Meeting of MRS-J, 2018. 12. 19, 北九州国際会議場. (265) 郡司貴雄，井澤 佑，松本 太，コア-シェル構造を有する電極触媒の創?とCO2 還元反応における選択性，表面技術協会第139回講演大会，2019.3.18-19, 神奈川大学. (264) 横井健?，河合陽賢，林 遥介，松本 太，耐薬品性無電解Sn-Ni 合?の作製および評価，表面技術協会第139回講演大会，2019.3.18-19, 神奈川大学. (263) 鈴?彗之，郡司貴雄，?坂武男，松本 太、AlCl3-EMIC イオン液体からのアルミニウム電気めっきにおける添加剤の効果(4) −添加剤の分?構造と光沢性の関係−，表面技術協会第139回講演大会，2019.3.18-19, 神奈川大学. (262) 津?喬史，安東信雄，?原悠太，中村 奨，板垣 薫，杣 直彦，林 成実，郡司貴雄,　?坂武男，松本 太, ピコ秒レーザーを?いた三次元表?構造を有する?あき電極の作製及びリチウムイオン?次電池への適?，表面技術協会第139回講演大会，2019.3.18-19, 神奈川大学. (261) 林 遥介，?品愛都，横井健?，河合陽賢，郡司貴雄，?坂武男，松本 太, ? ?触媒型無電解Ni-Sn めっき被膜の作製と耐薬品性の検討, 表面技術協会第139回講演大会，2019.3.18-19, 神奈川大学. (260) 郡司 貴雄，難波 功洋，大坂 武男，松本 太，種々の助触媒を担持したTiO2光触媒のCO2還元反応における選択性, 電気化学会第86回大会, 2019.3. 27-29 京都大学吉田キャンパス. (259) 郡司 貴雄，井澤 佑，大坂 武男，松本 太，CuxSny金属間化合物コア-Snシェル構造の合成と電気化学的CO2還元反応, 電気化学会第86回大会, 2019.3. 27-29 京都大学吉田キャンパス. (258) 安藤 風馬，田邉 豊和，郡司 貴雄，金子 信悟，大坂 武男，松本 太，担持体および第二元素を用いたPt系金属間化合物ナノ粒子のPt d-バンドセンターのチューニングによるORR活性の向上に関する検討(4)，電気化学会第86回大会, 2019.3. 27-29 京都大学吉田キャンパス. (257) 野村 文洋，津田 喬史，田邊 豊和，金子 信吾，大阪 武男，松本 太，Li2MnO3-LiMO2 Li過剰系固溶体正極材料の合成における焼成条件と充放電容量およびサイクル安定性の関係，電気化学会第86回大会, 2019.3. 27-29 京都大学吉田キャンパス. (256) 津田 喬史，安藤 信雄，石原 悠太，中村 奨，板垣 薫，杣 直彦，林 成実，郡司 貴雄，大坂 武男，松本 太，ピコ秒パルスレーザーを用いて作製された穴あき厚塗り塗工LiFePO4電極の出力特性及び充放電メカニズムの検討，電気化学会第86回大会, 2019.3. 27-29 京都大学吉田キャンパス. (255) 渡邉 達也，津田 喬史，安藤 信雄，中村 奨，板垣 薫，杣 直彦，林 成実，郡司 貴雄，大坂 武男，松本 太，積層型穴あきグラファイト電極を用いたリチウムイオン電池における不可逆容量のキャンセルによる電池容量の向上，電気化学会第86回大会, 2019.3. 27-29 京都大学吉田キャンパス. (254) Futoshi Matsumoto, Tanabe Toyokazu, Application of porous electrodes prepared with picosecond pulsed laser to lithium ion battery, 22nd Topical Meeting of the International Society of Electrochemistry, 2018. 4.17, Waseda Univeristy. (253) Takashi Tsuda, Nobuo Ando, Naoto Mitsuhashi, Toyokazu Tanabe, Kaoru Itagaki, Naohiko Soma, Susumu Nakamura, Narumi Hayashi, Futoshi Matsumoto, Fabrication of Porous Electrodes with a Picosecond Pulsed Laser and Improvement of the Rate Performance of a Porous Graphite Anode, LiFePO4 and LiFePO4/Activated Carbon Cathodes, 22nd Topical Meeting of the International Society of Electrochemistry, 2018. 4.17, Waseda Univeristy. (252) Fuma Ando, Takashi Tsuda, Toyokazu Tanabe, Takeo Ohsaka, Futoshi Matsumoto, Relationship between d-band center of Dealloyed PtPb Ordered Intermetallic Nanoparticle Deposited on TiO2/ Cup-Stacked Carbon Nanotube and ORR Activity in Acidic Aqueous Media, 22nd Topical Meeting of the International Society of Electrochemistry, 2018. 4.17, Waseda Univeristy. (251) Fumihiro Nomura, Takashi Tsuda, Toyokazu Tanabe, Takeo Ohsaka, Futoshi Matsumoto, Optimization of Calcination Temperature in Preparation of a High Capacity Li-rich Solid-Solution Li[Li0.2Ni0.18Co0.03Mn0.58]O2 Material and Its Cathode Performance in Lithium Ion Battery, 22nd Topical Meeting of the International Society of Electrochemistry, 2018. 4.17, Waseda Univeristy. 233rd ECS meeting, Washington State Convention Center, 2018.5. 13-17, Seattle, USA. (249) F. Nomura, T. Tanabe, T. Gunji, F. Matsumoto, Effect of the Cooling Process on the Structure and Charge/Discharge Cycling Performance in Li[Li Mn Ni Co ]O Li-rich Solid-Solution Layered Oxide Cathode Materials for Li-Ion Battery, 233rd ECS meeting, Washington State Convention Center, 2018.5. 13-17, Seattle, USA. (248) T. Tsuda, N. Ando, Y. Haruki, T. Tanabe, T. Gunji, K. Itagaki, N. Soma, S. Nakamura, N. Hayashi, F. Matsumoto, Study on Li Metal Deposition, SEI Formation on Anodes and Cathode Potential Change during the Pre-Lithiation Process in a Cell Prepared with Laminated Porous Anodes and Cathodes, 233rd ECS meeting, Washington State Convention Center, 2018.5. 13-17, Seattle, USA. (247) 安藤 風馬, 田邉 豊和, 郡司 貴雄, 金子 信吾, 大坂 武男, 松本 太, 担持体および第二元素を用いたPt系金属間化合物ナノ粒子のPt d-バンドセンターのチューニングによるORR活性の向上に関する検討(3), 2018年電気化学秋季大会, 2018.9.25-26, 金沢大学. (246) 郡司 貴雄, Noh Seung, 安藤 風馬, Byungchan Han, 大坂 武男, 田邉 豊和, 松本 太, Pd系金属間化合物ナノ粒子の電極触媒活性, 2018年電気化学秋季大会, 2018.9.25-26, 金沢大学. (245) 野村 文洋, 津田 喬史, 田邊 豊和, 郡司 貴雄, 金子 信悟, 大坂 武男, 松本 太, 組成探索に基づくLIB用Li2MnO3-LiMO2 Li過剰系固溶体正極材料の高性能化および合成条件の最適化, 2018年電気化学秋季大会, 2018.9.25-26, 金沢大学. (244) 安藤??，?邉豊和，郡司貴雄，? ?信吾，?坂武男，松本 太, 担持体および第?元素を?いたPt 系?属間化合物ナノ粒?のPt d-バンドセンターのチューニングによるORR 活性の向上に関する検討, 表面技術協会第138回講演大会, 2018.9.13-14, 北海道科学大学. (243) 津?喬史，安東信雄，松原?樹，中村 奨，板垣 薫，杣 直彦，林 成実，松本 太, ピコ秒レーザーを?いた三次元表?構造を有する?あき電極の作製及びリチウムイオン?次電池への適?, 表面技術協会第138回講演大会, 2018.9.13-14, 北海道科学大学. (242) Fuma Ando, Toyokazu Tanabe, Takao Gunji, Shingo Kaneko, Tsuyoshi Takeda, Takeo Ohsaka, Futoshi Matsumoto, Effect of the d-Band Center on the Oxygen Reduction Reaction Activity of Electrochemically Dealloyed Ordered Intermetallic Platinum−Lead (PtPb) Nanoparticles Supported on TiO2-Deposited Cup-Stacked Carbon Nanotubes, 「グリーンエネルギー変換工学」第７回国際セミナー, 2018.8.22-23, 山梨大学. (241) 津?喬史，安東信雄，松原?樹，中村 奨，板垣 薫，杣 直彦，林 成実，松本 太, ピコ秒レーザーを用いて作製された穴あき電極のリチウムイオン二次電池への適用および高出力化, 化学電池材料研究会 第42 回講演会・夏の学校, 2018.8.6-8, 京都. (240) 野村 文洋, 津田 喬史, 田邊 豊和, 郡司 貴雄, 金子 信悟, 大坂 武男, 松本 太, 組成探索に基づくLIB用Li2MnO3-LiMO2 Li過剰系固溶体正極材料の高性能化および合成条件の最適化, 化学電池材料研究会 第42 回講演会・夏の学校, 2018.8.6-8, 京都. (239) 安藤 風馬, 田邉 豊和, 郡司 貴雄, 金子 信吾, 大坂 武男, 松本 太, 担持体および第二元素を用いたPt系金属間化合物ナノ粒子のPt d-バンドセンターのチューニングによるORR活性の向上に関する検討,電気化学会関東支部第36回夏の学校, 2018.8.30-31, 八王子セミナーハウス. (238) 野村 文洋, 津田 喬史, 田邊 豊和, 郡司 貴雄, 金子 信悟, 大坂 武男, 松本 太, 組成探索に基づくLIB用Li2MnO3-LiMO2 Li過剰系固溶体正極材料の高性能化および合成条件の最適化, 電気化学会関東支部第36回夏の学校, 2018.8.30-31, 八王子セミナーハウス. (237) 津?喬史，安東信雄，松原?樹，中村 奨，板垣 薫，杣 直彦，林 成実，松本 太, ピコ秒レーザーを用いて作製された穴あき電極のリチウムイオン二次電池への適用および高出力化, 電気化学会関東支部第36回夏の学校, 2018.8.30-31, 八王子セミナーハウス. (236) 松本　太, 電気化学反応・電極反応のメカニズムと電気化学測定法および電極／溶液界面の解析〜電気化学の基礎、いろいろ組み合わせた各種測定法、ＣＶ法、交流インピーダンス法〜, Science＆Technologyセミナー(東京・流通センター), 2018.4.19. (235) 松本　太, リチウム電池用水系バインダーの高電圧高容量正極への適用とその性能評価『リチウム電池用水系バインダーの高電圧正極での適用と性能評価』, 技術情報協会セミナー (東京都，五反田), 2018.4.25. (234) 松本　太,「リチウム過剰系正極への水系バインダーの適用と長寿命化」リチウム過剰系正極材料のサイクル特性向上技術, 技術情報協会セミナー (東京都，五反田), 2018.5.10. (233) 松本 太, 次世代電池のキーテクノロジと材料開発〜穴あき電極、バインダー活物質材料のコティグなど〜, 電気・電子材料技術セミナー Insulation 2018 −EV 技術 と関連材料技術 と関連材料技術−,電気機能材料工業会, 2018.11.29, 東京・亀戸. (232) 郡司貴雄、「金属間化合物ナノ粒子の創生と電極触媒反応への適用」, 第124回電気化学会関東支部サイエンスレクチャー, 2019. 2. 20, 東京. (231) F. Ando, T. Tanabe, T. Gunji, S. Kaneko, T. Ohsaka, F. Matsumoto, Improvement of Electrochemical ORR Activity and Its Durability with Pt Electrocatalyst Nanoparticles Anchored on MO x /Cup-Stacked Carbon Nanotube in Acidic Aqueous Media, 231th ECS meeting, 2017.5.28-6.1, New Orleans, USA. (230) T. Tsuda, F. Ando, Y. Mochizuki, T. Gunji, T. Tanabe, S. Kaneko, T. Ohsaka, K. Itagaki, N. Soma, F. Matsumoto, Fabrication of Porous Current Collectors for Li Ion Capacitor with Pico-Second Pulse Laser and Acceleration of Li+ Ion Pre-Doping Reaction to Laminated Graphite/Porous Current Collector Anodes, 231th ECS meeting, 2017.5.28-6.1, New Orleans, USA. (229) F. Matsumoto, N. Tamura, T. Tsuda, T. Gunji, T. Tanabe, S. Kaneko, and T. Ohsaka, Dependences of Discharge Capacity, Retention of Discharge Capacity, Average Discharge Voltage and Energy Density, and Rate Capability on the Composition of XLi2MnO3-YLiNi1/2Mn1/2O 2-(1-x-y)LiNi1/3Co1/3Mn1/3O2 Li-Rich Solid-Solution Cathode Materials for Li-Ion Battery (II), 231th ECS meeting, 2017.5.28-6.1, New Orleans, USA. (228) F. Matsumoto, T. Tanabe, T. Gunji, T. Tsuda, S. Kaneko, T. Ohsaka, Evaluation of Key Factors for Preparing High Brightness Surfaces of Aluminum Films Electrodeposited from AlCl3-1-Ethyl-3-Methylimidazolium Chloride-Organic Additive Baths231th ECS meeting, 2017.5.28-6.1, New Orleans, USA. (227) F. Ando. T. Tanabe, T. Ohsaka, F. Matsumoto, Development of Metal ixide-Supported Metal and Ordered Intermetallic Nanoparticles to Enhance the Oxygen Reduction Reaction in PEMFC, Advances in Functional Materials, 2017.8.14-17, UCLA, Los Angeles, USA. (226) 津田喬史, 安東信雄, 三橋直人,中村奨, 田邉豊和, 板垣薫, 杣直彦,林成実, 松本太, 積層型穴あきグラファイト電極における電極上の開口条件および反応温度とLi+イオンプレドープ速度との関係, 2017年電気化学秋季大会, 2017.9.10-11, 長崎大学. (225) 安藤 風馬, 田邊 豊和, 郡司 貴雄, 金子 信悟, 大坂 武男, 松本 太, 担持体および第二元素を用いたPt系金属間化合物ナノ粒子のPt d-バンドセンターのチューニングによるORR活性の向上に関する検討，2017年電気化学秋季大会, 2017.9.10-11, 長崎大学. (224) 劉 雨彬, 入井 友海太, 槇 文彦, 田邉 豊和, 宮本 康暉, 大坂 武男, 松本 太，水系バインダー適用のためのLiNixCoyAl1-x-yO2 (x > 0.9) 高容量正極材料粒子の表面コーティングと充放電特性の安定化, 2017年電気化学秋季大会, 2017.9.10-11, 長崎大学. (223) 田邉 豊和, 中森 勝俊, 金子 信悟, 大坂 武男, 松本 太, 混合原子価スズ酸化物を用いた純水及び犠牲剤水溶液からの可視光照射下水素発生の検討（神奈川大学2017年電気化学秋季大会, 2017.9.10-11, 長崎大学. (222) 高分解能透過電子顕微鏡を用いた高酸素還元触媒活性を有するPtPb/TiO2/カップスタックカーボンナノチューブの触媒表面の状態解析, 安藤風馬，田邉豊和，郡司貴雄，金子信悟，大坂武男，松本 太, 表面技術協会第136回講演大会, 2017.9.14-15,金沢工業大学. (221) 置換析出により作製したビスマステルライド系薄層の熱電変換特性, 金子信悟，國谷翔太郎，矢�ｱ将志，大坂武男，田邉豊和，松本 太，表面技術協会第136回講演大会, 2017.9.14-15,金沢工業大学. (220) Fuma Ando, Toyokazu Tanabe, Takao Gunji, Shingo Kaneko, Takeo Ohsaka, Futoshi Matsumoto, Improvement of Electrochemical ORR Activity and Its Durability with Pt Electrocatalyst Nanoparticles Anchored on MOx/Cup-Stacked Carbon Nanotube in Acidic Aqueous Media, The 6th International Seminar for Special Doctoral Program “Green Energy Conversion Science and Technology”, 2017.9.13-15, Nagano, Japan. (219) 津田喬史, 安東信雄, 三橋直人,中村奨, 田邉豊和, 板垣薫, 杣直彦,林成実, 松本太, 積層型穴あきグラファイト電極における電極上の開口条件および反応温度とLi+イオンプレドープ速度との関係, 2017年電気化学関東支部夏の学校, 2017.9.25-26, 八王子大学セミナーハウス. (218) 安藤 風馬, 田邊 豊和, 郡司 貴雄, 金子 信悟, 大坂 武男, 松本 太, 担持体および第二元素を用いたPt系金属間化合物ナノ粒子のPt d-バンドセンターのチューニングによるORR活性の向上に関する検討，2017年電気化学関東支部夏の学校, 2017.9.25-26, 八王子大学セミナーハウス. (217) 劉 雨彬, 入井 友海太, 槇 文彦, 田邉 豊和, 宮本 康暉, 大坂 武男, 松本 太，水系バインダー適用のためのLiNixCoyAl1-x-yO2 (x > 0.9) 高容量正極材料粒子の表面コーティングと充放電特性の安定化, 2017年電気化学関東支部夏の学校, 2017.9.25-26, 八王子大学セミナーハウス. (216) Y. Liu, T. Tanabe, K. Miyamoto, Y. Irii, F. Maki, T. Gunji, S. Kaneko, S. Ugawa, H.-J Lee, T. Ohsaka, F. Matsumoto, Synthesis of Water-Resistant thin TiOx Layer-Coated High-Capacity LiNiaCobAl1-a-bO2 (a> 0.85) Cathode and Its Stable Charge/Discharge Cycle Cathode Performance to Apply a Water-Based Hybrid Polymer Binder to Li-Ion Batteries, 232th ECS meeting, 2017.10.1-5, National Harbor, MD, USA. (215) F. Ando, T. Tanabe, T. Gunji, T. Tsuda, S. Kaneko, T. Takeda, T. Ohsaka, F. Matsumoto, Relationship Between ORR Catalytic Activity and D-Band Center of Pt Nanoparticle Deposited on Metal Oxide Support Materials, 232th ECS meeting, 2017.10.1-5, National Harbor, MD, USA. (214) T. Tsuda, N. Ando, T. Gunji, T. Tanabe, S. Kaneko, K. Itagaki, N. Soma, S. Nakamura, F. Matsumoto, Improvement of Rate Performance of LiFePO4 Cathode with Porous LiFePO4/Activated Carbon Hybrid Electrode Structure, 232th ECS meeting, 2017.10.1-5, National Harbor, MD, USA. (213) 安藤 風馬, 田邊 豊和, 大坂 武男, 松本 太, 固体高分子形燃料電池用酸素還元電極触媒の触媒活性と電極触媒表面の電子状態の関係の解明, 7th CSJ Chemistry Festa, 2017.10-17-19, タワーホール船堀, 東京. (212) 津田喬史, 田邉豊和, 安東信雄, 中村奨, 板垣薫, 杣直彦, 林成実, 松本太, 穴あきLiFePO4/活性炭ハイブリッド電極構造によるLiFePO4正極の高出力化, 7th CSJ Chemistry Festa, 2017.10-17-19, タワーホール船堀, 東京. (211) T. Gunji, T. Tanabe, T. Ohsaka, F. Matsumoto, The Enhanced Electrocatalytic Activity over Pd-base Intermetallic Compound, International Symposium on Novel Energy Nanomaterials, Catalysts and Surfaces for Future Earth- Material Research, Characterization and Imaging by In situ/Operando XAFS and X-ray Techniques -, 2017.10.28-30, The University of Electro-Communications, Tokyo. (210) F. Ando, T. Tanabe, T. Gunji, T. Ohsaka, F. Matsumoto, Relationship between ORR Catalytic Activity and d-band Center of Pt and Pt-based, Alloy Nanoparticle Deposited on Metal Oxide Support Materials, 2017.10.28-30, The University of Electro-Communications,Tokyo. (209) F. Nomura, L. Yubin, T. Tanabe, T. Ohsaka, F. Matsumoto, Optimization of Calcination Conditions in Preparation of a High Capacity Li-rich Solid-Solution Li[Li0.2Ni0.18Co0.03Mn0.58]O2 Material and its Cathode Performance in Lithium Ion Battery, 2017.10.28-30, The University of Electro-Communications,Tokyo. (208)安藤 風馬, 田邊 豊和, 大坂 武男, 松本 太, Ptナノ粒子およびPtPbナノ粒子/TiO2/カップスタックカーボンナノチューブの電極触媒特性と耐久性の向上, 平成29年度　神奈川県ものづくり技術交流会, 2017. 11.8, 神奈川県立産業技術総合研究所. (207) 津田喬史, 田邉豊和, 安東信雄, 中村奨, 板垣薫, 杣直彦, 林成実, 松本　太, 穴あきLiFePO4/活性炭ハイブリッド電極構造によるLiFePO4正極の高出力化, 平成29年度　神奈川県ものづくり技術交流会, 2017. 11.8, 神奈川県立産業技術総合研究所. (206) 津田喬史, 田邉豊和, 安東信雄, 中村奨, 板垣薫, 杣直彦, 林成実, 松本　太, ピコ秒レーザーを用いた穴あきグラファイト負極の作製およびプレドープ反応の促進, 第27回日本MRS年次大会, 2017. 12.5, 横浜情報文化センター. (205) 安藤 風馬, 田邊 豊和, 大坂 武男, 松本 太, Pt/酸化チタン/カップスタックカーボンナノチューブ上での酸性水溶液中における酸素還元反応の促進および耐久性の向上, 第27回日本MRS年次大会, 2017. 12.5, 横浜情報文化センター. (204) 安藤 風馬, 田邊 豊和, 大坂 武男, 松本 太, Pt/酸化チタン/カップスタックカーボンナノチューブ上での酸性水溶液中における酸素還元反応の促進および耐久性の向上, 第27回キャラクタリゼーション講習会「触媒および表面の解析に役立つキャラクタリゼーションの基礎と実際」, 2017. 12.8, 熊本大学. (203) 津田 喬史, 安東 信雄, 松原 一樹, 中村 奨, 田邉豊和, 板垣 薫, 杣 直彦, 林 成実, 松本 太, ピコ秒レーザーを用いて作製された穴あき電極のリチウムイオン二次電池への適用および高出力化, 電気化学会 電気化学会第85回大会, 2018.3.9, 東京理科大学葛飾キャンパス. (202) 劉 雨彬, 田邊 豊和, 大坂 武男, 浅井 悠太, 鵜川晋作, イ ホジン, 松本 太, 水系バインダー適用のための Li過剰系固溶体正極材料の組成探索および水暴露後の正極粒子の表面構造解析, 電気化学会 電気化学会第85回大会, 2018.3.9, 東京理科大学葛飾キャンパス. (201) 津田 喬史, 安東 信雄, 一色 晃太, 中村 奨, 田邉豊和, 板垣 薫, 杣 直彦, 林 成実, 松本 太, 穴あき LiFePO4/活性炭ハイブリッド電極構造による LiFePO4正極の高出力化および反応機構解析, 電気化学会 電気化学会第85回大会, 2018.3.9, 東京理科大学葛飾キャンパス. (200) 安藤 風馬, 田邉 豊和, 郡司 貴雄, 金子 信悟, 大坂武男, 松本 太, 担持体および第二元素を用いた Pt系金属間化合物ナノ粒子の Pt d-バンドセンターのチューニングによるORR活性の向上に関する検討(2), 電気化学会 電気化学会第85回大会, 2018.3.10, 東京理科大学葛飾キャンパス. (199) 田邉 豊和, 近藤 託弥, 宮内 雅浩, 金子 信悟, 大坂武男, 松本 太, Pt-M合金微粒子担持 TiO2ナノロッドにおける高効率IPA分解反応, 電気化学会 電気化学会第85回大会, 2018.3.10, 東京理科大学葛飾キャンパス. (198) 野村 文洋, 津田 喬史, 田邊 豊和, 金子 信悟, 大坂 武男, 松本 太, 組成探索に基づく LIB用 Li2MnO3-LiMO2Li過剰系固溶体正極材料の高性能化および合成条件の最適化, 電気化学会第85回大会, 2018.3.10, 東京理科大学葛飾キャンパス. (197) 安藤 風馬, 田邉 豊和, 郡司 貴雄, 金子 信悟, 大坂 武男, 松本 太, 高分解能透過電子顕微鏡を用いた高酸素還元触媒活性を有する PtおよびPtPb/TiO2/カップスタックカーボンナノチューブの触媒表面の状態解析, 電気化学会第85回大会, 2018.3.10, 東京理科大学葛飾キャンパス. (196) 國谷翔太郎，金子信悟，大坂武男，田邉豊和，松本　太, 置換析出によって作製したビスマステルライド系薄層の作製条件依存性, 表面技術協会第137 回講演大会, 2018.3.12, 芝浦工業大学豊洲キャンパス. (195) 松本　太, “Pt系金属間化合物の電極触媒への適用 —ナノ化，コアシェル化，合金化などによる白金低減化技術ー“　白金代替触媒および 触媒開発における白金使用量の低減化, 技術情報協会セミナー (東京都，五反田), 2017.4.11. (194) A. J. Jeevagan, T. Gunji, T. Tanabe, S. Kaneko, and F. Matsumoto, Synthesis of Reduced Graphene Oxide-Supported PtAu Catalysts and Their Electrocatalytic Activity for Formic Acid Oxidation, 229th ECS meeting, 2016.5.29-6.2, San Diego, US. (193) F. Matsumoto, S. Kaneko, T. Gunji, and T. Tanabe, The Effect of Brighteners on the Fabrication of Electroplated Bright Aluminum Films Using an AlCl3-Emic-Toluene Bath (2), 229th ECS meeting, 2016.5.29-6.2, San Diego, US. (192) T. Gunji, R. Wakabayashi, H. D. Abruña, F. DiSalvo and F. Matsumoto, The Effect of Alloying of Transition Metals (M = Fe, Co and Ni) to Palladium Catalyst on Durability of Electrocatalytic Activity of Oxygen Reduction Reaction in Alkaline Media, 229th ECS meeting, 2016.5.29-6.2, San Diego, US. (191) F. Ando, T. Gunji, T. Tanabe, S. Kaneko, T. Takeda, T. Ohsaka, and F. Matsumoto, Enhancement of the Oxygen Reduction Reaction (ORR) on a PtPb Nanoparticle /TiO2/Cup-stacked Carbon Nanotube Composite in Acidic Aqueous Solutions based on the Electronic Interaction between PtPb and TiO2, 229th ECS meeting, 2016.5.29-6.2, San Diego, US. Nanoparticles towards Electrooxidation of Formic Acid, 電気化学会関東支部第34回夏の学校, 八王子セミナーハウス, 2016.9.8-9. (189) 安藤風馬, 田邉豊和，金子信悟，大坂武男,松本 太, Development of Metal Oxide-Supported Metal and Ordered Intermetallic Nanoparticles to Enhance the Oxygen Reduction Reaction in PEMFC, 電気化学会関東支部第34回夏の学校, 八王子セミナーハウス, 2016.9.8-9. (188) 劉 雨彬, 田邉豊和，金子信悟，大坂武男,松本 太, Cu-Sn Bimetallic Nanoparticles supported on carbon for Electrochemical Reduction of CO2 to CO in Aqueous Media, 電気化学会関東支部第34回夏の学校, 八王子セミナーハウス, 2016.9.8-9. (187) 田邉 豊和, 宮澤 亘, 郡司 貴雄, 伊藤 皇成, 金子 信悟, 大坂 武男, 宮内 雅浩, 松本 太, TiO2ナノロッド還元反応サイトへのPt-Pb 合金微粒子助触媒の選択的担持と担持結晶面の酢酸光酸化分解反応への影響, 日本金属学会 2016年秋期講演大会(第159回),大阪大学, 2016.9.21-2. (186 K. Miyamoto, T. Gunji, Y. Mochizuki, S. Kaneko, T. Tanabe, T. Ohsaka, F. Matsumoto, The Examination of the Composition of xLi2MnO3-yLiNi0.5Mn0.5O 2-zLiNi1/3Co1/3Mn1/3O2 Solid-Solution Cathode Materials Exhibiting High Capacity, Discharge Voltage and Rate Performance, PRiME2016, 2016.10.2-7, Hawaii Convention Center, Honolulu, USA. (185) T. Gunji, T. Tanabe, S. Kaneko, T. Ohsaka, and F. Matsumoto, the Enhanced Electrocatalytic Activity over Carbon-Supported Pd-Based Ordered Intermetallic Compounds, PRiME2016, 2016.10.2-7, Hawaii Convention Center, Honolulu, USA. (184) F. Matsumoto, T. Gunji, T. Tanabe, S. Kaneko, and T. Ohsaka, Facile Route for the Preparation of Ordered Intermetallic Pt3Pb-PtPb Core-Shell Nanoparticles and Its Enhanced Activity for Alkaline Methanol and Ethanol Oxidation, PRiME2016, 2016.10.2-7, Hawaii Convention Center, Honolulu, USA. (183) T. Ohsaka (Kanagawa University, Tokyo Institute of Technology), S. H. Noh, M. H. Seo, J. Kang, T. Okajima, B. Han, F. Matsumoto, Design of Metal Structure Encapsulated in N-Doped Carbon Layers As Tunable Catalyst for Electrochemical Applications, PRiME2016, 2016.10.2-7, Hawaii Convention Center, Honolulu, USA. (182) T. Tanabe, M. Hashimoto, T. Tanikawa, T. Gunji, S. Kaneko, T. Ohsaka, and F. Matsumoto, Mixed Valence Tin Oxide Sn3O4 : A Visible-Light Driven Semiconductor for Photocatalytic Water Splitting Under Visible Light Irradiation, PRiME2016, 2016.10.2-7, Hawaii Convention Center, Honolulu, USA. (181 T. Tanabe, W. Miyazawa, T. Gunji, M. Hashimoto, S. Kaneko, T. Ohsaka, F. Matsumoto, Site-Selective Binary Alloy Nanoparticles Deposition on TiO2 Nanorod for Acetic Acid Oxidative Decomposition Under UV-Vis Irradiation, PRiME2016, 2016.10.2-7, Hawaii Convention Center, Honolulu, USA. (180) T. Gunji, S. Kaneko, T. Tanabe, T. Ohsaka, F. Matsumoto, the Relationship Between Brightness of Aluminum Films Fabricated Using an AlCl 3-1-Ethyl-3-Methylimidazolium Chloride-Toluene Bath and Molecular Structure of Additives, PRiME2016, 2016.10.2-7, Hawaii Convention Center, Honolulu, USA. (179) K. Miyamoto, Y. Honma, T. Gunji, T. Tanabe, S. Kaneko, T. Ohsaka, S. Ugawa, H. J. Lee, Y. Ootsuka, F. Matsumoto, the Application of a Water-Based Hybrid Polymer Binder to a High-Voltage and High-Capacity Li-Rich Solid-Solution Cathode and Its Performance in Li-Ion Batteries, PRiME2016, 2016.10.2-7, Hawaii Convention Center, Honolulu, USA. Oxygen Reduction Reaction in PEMFC, PRiME2016, 2016.10.2-7, Hawaii Convention Center, Honolulu, USA. (177) 安藤風馬, 田邉豊和, 郡司貴雄, 金子信悟, 大坂武男, 松本 太, Pt系ナノ粒子/TiO2/カップスタックカーボンナノチューブの電極触媒特性と耐久性の向上, 平成28年神奈川県ものづくり交流会, 2016.10.26, 神奈川県産業技術センター, 海老名. (176) 松本 太, 田邉豊和, 郡司貴雄, 金子信悟, 大坂武男, AlCl3-EMIC イオン液体からのアルミニウム電気めっきにおける添加剤の効果−添加剤の分子構造と光沢性の関係−, 平成28年神奈川県ものづくり交流会, 2016.10.26, 神奈川県産業技術センター, 海老名. (175) 松本太, 中村亮介, 望月康正, 郡司貴雄, 田邉豊和, 金子信悟, 大坂武男, 板垣薫, 杣直彦, 孔空き集電銅箔を用いたLi+イオンドープ反応の高速化のための孔デザインの最適化, 第57回電池討論会, 2016.11.29., 幕張メッセ. (174) 小山 昇，山口 秀一郎，古館 林，望月 康正，羽田 睦雄，大坂 武男，岡島 武, 松本 太, "多重インピーダンス計測によるリチウム二次電池モジュール劣化度診断の簡便法の開発", 第57回電池討論会, 2016.11.29., 幕張メッセ. (171) 矢�ｱ将志，金子信悟，郡司貴雄，大坂武男，田邉豊和，松本 太, 置換析出に基づくビスマステルライド系薄層の作製とその熱電変換特性, 表面技術協会第135回講演大会, 2017.3.9-10, 東洋大学川越キャンパス. (170) 郡司貴雄，川崎大樹，伊藤拳人，金子信悟，田邉豊和，松本 太, 多重定電流パルスめっき法を用いて作製したNi/Cu およびNi/Ni-P 多層膜の断面観察と耐摩耗性の膜厚依存性, 表面技術協会第135回講演大会, 2017.3.9-10, 東洋大学川越キャンパス. (169) 田邉 豊和, 伊藤 皇聖, 郡司 貴雄, 宮内 雅浩, 金子 信悟, 大坂 武男, 松本 太, Pt-Pb合金微粒子/TiO2ナノロッド光触媒によるVOC完全酸化分解反応,日本金属学会2017年春期大会, 2017.3.15-17, 首都大学東京. (168) 田邉 豊和, 伊藤 皇聖, 郡司 貴雄, 宮内 雅浩, 金子 信悟, 大坂 武男, 松本 太, TiO2ナノロッドの露出面制御とPt-Pb合金微粒子担持による高効率なVOC酸化分解反応,電気化学会第84回大会, 2017.3.25-27, 首都大学東京. (167) 郡司 貴雄, 田邊 豊和, 安藤 風馬, 大坂 武男, 松本 太, 白金フリーを志向した新規電極触媒の創生および酸性水溶液中における酸素還元反応と触媒の構造・電子状態の相関, 電気化学会第84回大会, 2017.3.25-27, 首都大学東京. (166) 津田喬史, 井波祐貴, 中村亮介, 安藤風馬, 望月康正, 郡司貴雄, 田邉豊和, 金子信悟, 板垣薫, 杣直彦, 松本 太, Liイオンキャパシタ用電極作製のための穴空き集電銅箔を用いたLiイオンドープ反応の高速化および穴空き集電箔のリチウムイオン二次電池への適用, 電気化学会第84回大会, 2017.3.25-27, 首都大学東京. (165) 松本 太, 田邉 豊和, 郡司 貴雄, 望月 康正, 金子 信悟, 大坂 武男, 鵜川 晋作, 大塚 巧治, イ ホジン, 水系バインダー適用のためのLiNi0.5Mn1.5O4高電圧正極材料粒子の表面コーティングと充放電特性の安定化, 電気化学会第84回大会, 2017.3.25-27, 首都大学東京. (164) 松本 太, 高電圧・高容量正極材料への水系バインダーの適用と性能評価, 『リチウム二次電池向けバインダーの高電圧対応設計と最適選定 』, 技術情報協会(東京, 五反田), 2016.7.7. (163) 松本 太, 固体高分子形燃料電池用金属間化合物ナノ粒子電極触媒の合成と電極触媒活性の向上, 都市環境学部第365回応化コロキウム, 首都大学東京, 2016.7.29. (162) 田邉 豊和, 可視光水分解を指向したSn酸化物光触媒の創製と合金微粒子の反応サイト選択担持による反応高効率化, 電気化学会関東支部第34回夏の学校, 八王子セミナーハウス, 2016.9.8-9. (161) 金子信悟, 松本 太, "めっき膜の物性向上に向けた体系的研究—物性と結晶構造の関わり—", ファインプレーティング研究会, (関東学院大学, 関内), 2016,10.4. (160) 松本 太, 企業講演会"電気化学反応と測定・解析",サン工業株式会社 (長野県，伊那市), 2016.10.21. (159) T. Tanabe, Controlled deposition of Pt-Pb alloy nanoparticles on TiO2 nanorods: improved photocatalytic activity with site-selective co-catalyst loading, BIT's 6th Annual World Congress of Nano Science & Technology – 2016, 2016.10.26-28, Holiday Inn Singapore Atrium, Singapore. (158) T. Tanabe, M. Hashimoto, T. Tanikawa, T. Gunji, S. Kaneko, T. Ohsaka and F. Matsumoto, Visible light-driven water splitting using mixed-valence Tin oxide semiconductor photocatalyst, EMN Meeting on Energy and Sustainability, 2016.11.28-12.2, Osaka, Japan. 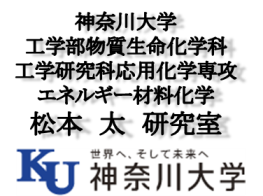 (157) Futoshi Matsumoto, Application of Ordered Intermetallic Compounds to Polyer Electrolyte Membrane Fuel Cells as Electrocatalysts, Exchange Sympodium of National Taiwan University and Kanagawa University, Taiwan, 2017-3-11. (156) 松本 太, リチウムイオンキャパシタ用電極作製のための穴空き集電銅箔を用いたLi+ドープ反応の高速化および穴あき集電箔のリチウムイオン二次電池への適用, リチウムイオンキャパシタ、リチウムイオン二次電池 プレドープ・穴あき集電箔が開く次世代電池の未来横浜企業経営支援財団第219回産学交流サロン(横浜市), 2017.3.24. (155) 松本 太, 高電圧・高容量正極材料への水系バインダーの適用と性能評価, 技術情報協会セミナー(五反田、東京) 2017.3.23. (154) K. Uehara, T. Gunji, T. Tanabe, S. Kaneko, and F. Matsumoto, The Effect of Brighteners on the Fabrication of Electroplated High-Bright Aluminum Films Using AlCl3-Emic Ionic Liquids, 228th ECS meeting, 2015.10.11-15, Phoenix, US. (153) T. Gunji, T. Tanabe, S. Kaneko, and F. Matsumoto, Photocatalytic Decomposition of Various Organic Compounds over WO3 Supported Ordered Intermetallic PtPb Co-Catalyst, 228th ECS meeting, 2015.10.11-15, Phoenix, US. (152) T. Kuzuoka, T. Kouno, T. Koyama, Y. Morita, K. Yamazaki, S. Kaneko, T. Tanabe, T. Gunji, and F. Matsumoto, Development of Moving Micro-Machines That Use Hydrogen Peroxide and Glucose as Fuels, 228th ECS meeting, 2015.10.11-15, Phoenix, US. (151) Shingo Kaneko (Research Institute for Engineering, Kanagawa University, Yokohama, Japan), Yuichi Sato, Futoshi Matsumoto, Junwei Zheng, Decheng Li, Size-regulated Precursor-Based Synthesis of Lithium-Rich Layered Cathode Material Deriving High Rate Capability, 66th Annual meeting of International Society of Electrochemistry, 2015.10.4-9., Taipei, Taiwan. (150) 橋本真成, 田邉豊和, 谷川龍弘, 郡司貴雄, 金子信悟, 阿部英樹, 松本　太, 水分解を指向した可視光応答型Sn酸化物光触媒の合成と触媒活性, 第5回CSJ化学フェスタ2015, 2015.10.13-15., タワーホール船堀, 東京. (149) 橋本真成, 田邉豊和, 谷川龍弘, 郡司貴雄, 金子信悟, 阿部英樹, 松本　太, 混合原子価スズ酸化物光触媒Sn3O4: 可視光によるメタノール水溶液からの水素生成, 第25回日本MRS年次大会, 2015.12.8-10., 横浜開港記念会館, 横浜. (148) 橋本 真成, 田邉豊和, 谷川龍弘, 郡司貴雄, 金子信悟, 阿部英樹, 松本　太,可視光応答性混合価数Sn 酸化物の高純度合成と犠牲剤水溶液からの水素発生の検討, 第 22回シンポジウム, 光触媒反応の最近の展開, 東京理科大学野田キャンパス, 2015/12/4. (147) 郡司　貴雄, 橋本真成, 田邉豊和, 野澤寿章, 金子信悟, 松本　太, WO3光触媒担持金属間化合物PtPb助触媒による有機物の分解反応の検討, 第25回日本MRS年次大会, 2015.12.8-10, 横浜開港記念会館, 横浜. (146) Toyokazu Tanabe, Wataru Miyazawa, Takao Gunji, Shingo Kaneko, Masahiro Miyauchi, Futoshi Matsumoto, Site-selective Pt-Pb nanoparticles deposition on TiO2 nanorod photocatalyst for acetic acid oxidative decomposition under UV-Vis irradiation, PACIFICHEM2015, 2015.12.15-20, Honolulu, Hawaii, USA. (145) Toyokazu Tanabe, Masanari Hashimoto, Arockiam Jeevagan, Takao Gunji, Shingo Kaneko, Hideki Abe, Futoshi Matsumoto, Photocatalytic hydrogen evolution from aqueous methanol solution using mixed-valence Sn3O4 under visible light irradiation, PACIFICHEM2015, 2015.12.15-20, Honolulu, Hawaii, USA. (144) 郡司 貴雄,田邉 豊和,金子 信悟,松本 太, Pdをベースとした種々の合金触媒のアルカリ性水溶液中における酸素還元反応の触媒活性, 電気化学会第83回講演大会, 大阪大学, 2016.3.29-31. (143) 安藤 風馬,郡司 貴雄,田邉 豊和,金子 信悟,松本 太, Pt系ナノ粒子/TiO2/カップスタックカーボンナノチューブの電極触媒特性と耐久性の向上, 電気化学会第83回講演大会, 大阪大学, 2016.3.29-31. (142) 松本 太, 井波 祐貴, 郡司 貴雄,望月 康正, 金子 信悟, 田邉 豊和, Liイオンキャパシタ用電極作製のための穴空き集電銅箔を用いたLiプレドープ反応の高速化, 電気化学会第83回講演大会, 大阪大学, 2016.3.29-31. (141) 郡司 貴雄, 田邉 豊和, 金子 信悟, 松本 太, 金属酸化物上に担持したPt系触媒の酸素還元反応に関する触媒活性, 電気化学会第83回講演大会, 大阪大学, 2016.3.29-31. (140) 本間 陽平, 郡司 貴雄, 松本 太, 望月 康正, 田邉 豊和, 金子 信悟, 鵜川 晋作, 大塚 巧治, イ ボジン, 水系バインダー適用のための高電圧正極材料粒子の表面コーティングと充放電特性の向上, 電気化学会第83回講演大会, 大阪大学, 2016.3.29-31. (139) 田邉 豊和, 橋本 真成, 谷川 龍弘, 郡司 貴雄, 金子 信悟, 松本 太, 混合価数酸化物Sn3O4光触媒を用いた各種犠牲剤溶液からの水素発生及び酸素発生の検討, 電気化学会第83回講演大会, 大阪大学, 2016.3.29-31. (138) 金子信悟，守屋世界，田邉豊和，松本 太, 湿式法により作製したビスマステルライド系薄層の結晶構造と熱電変換特性の関係, 表面技術協会第133回講演大会, 2016.3.22-23, 早稲田大学西早稲田キャンパス. (137) 郡司貴雄，上原一真，金子信悟，田邉豊和，松本 太, AlCl3-EMIC イオン液体からのアルミニウム電気めっきにおける添加剤の効果(3) −添加剤の分子構造と光沢性の関係−, 表面技術協会第133回講演大会, 2016.3.22-23, 早稲田大学西早稲田キャンパス. (136) T. Gunji, T. Tanabe, S. Kaneko, F. Matsumoto, K. Sasaki, A. J. Jeevagan, Enhanced Oxygen Reduction Reactions and Stable Long-term Activity on TiO2-supported Dealloyed PtCu Nanoparticles in Acidic Aqueous Solutions, 227nd Meeting of ECS, Chicago, US, 2015.5, 24-28. (135) 郡司貴雄, 田邉豊和，金子信悟，松本 太, PtPb金属間化合物ナノ粒子を助触媒とした光触媒の合成と有機物分解反応の触媒活性の検討, 電気化学会関東支部第33回夏の学校, 八王子セミナーハウス, 2015.8.26-27. (134) 橋本真成, 田邉豊和，金子信悟，松本 太, 可視光応答型Sn3O4光触媒の高純度合成と犠牲剤溶液からの水素生成反応, 電気化学会関東支部第33回夏の学校, 八王子セミナーハウス, 2015.8.26-28. (133) Toyokazu Tanabe, Wataru Miyazawa, Takao Gunji, Shingo Kaneko, Masahiro Miyauchi, Futoshi Matsumoto, Site-selective deposition of Pt-Pb bimetallic alloy nanoparticles on rutile TiO2 nanorod for acetic acid decomposition under UV irradiation, First International Symposium on Recent Progress of Energy and Environmental Photocatalysis (Photocatalysis1) Tokyo University of Science, Japan, 2015. 9.3-4. (132) Toyokazu Tanabe, Hashimoto Masanari, Arockiam John Jeevagan, Takao Gunji, Shingo Kaneko, Hideki Abe, Futoshi Matsumoto, Photocatalytic hydrogen evolution from aqueous methanol over mixed valence tin oxide-Sn3O4 under visible light irradiation, First International Symposium on Recent Progress of Energy and Environmental Photocatalysis (Photocatalysis1) Tokyo University of Science, Japan, 2015. 9.3-4. (131) 金子信悟，川崎大樹，伊藤拳人，田邉豊和，松本 太, Cu/Ni多層めっきにおけるめっき層の構造と耐摩耗性の関係(2),表面技術協会第132回講演大会, 信州大学長野キャンパス, 2015. 9.9-10. (130）　郡司貴雄，田邉豊和，金子信悟，宮内雅浩，松本 太, PtPb金属間化合物助触媒/WO3光触媒の合成と触媒活性(2),表面技術協会第132回講演大会, 信州大学長野キャンパス, 2015. 9.9-10. (129) 松本　太, 上原一真, 方　雪琴, 金子信悟，田邉豊和, AlCl3-EMICイオン液体からのアルミニウム電気めっきにおける添加剤の効果(2),表面技術協会第132回講演大会, 信州大学長野キャンパス, 2015. 9.9-10. (128) 田邉 豊和,橋本 真成,谷川 龍弘,郡司 貴雄,金子 信悟,松本 太, 可視光応答型Sn3O4光触媒の高純度合成と犠牲剤溶液からの水素生成反応, 電気化学秋季大会, 埼玉工業大学, 2015. 9.11-12. (127) 郡司 貴雄, 田邉 豊和, 金子 信悟, 宮内 雅浩, 松本 太, PtPb金属間化合物ナノ粒子を助触媒とした光触媒の合成と有機物分解反応の触媒活性の検討,電気化学秋季大会, 埼玉工業大学, 2015. 9.11-12. (126) 松本 太,郡司 貴雄,安藤 風馬,竹田 剛士,藤間 光,田邉 豊和,金子 信悟, PtPb/TiO2/カップスタック型カーボンナノチューブの合成と電極触媒反応への適用 電気化学秋季大会, 埼玉工業大学, 2015. 9.11-12. (125) 松本　太, “電気化学反応と測定・解析“, Science & Technology株式会社主催(東京，大井町), 2015.12.17-18. (124) Futoshi Matsumoto, Application of Ordere Intermetallic Nanoparticles to Electrocatalyst of Polymer Electrolyte Membrane Fuel Cell, Energy Material Nanotechnology Meeting 2016, Orland USA, 2016.2.21-25. (123) 松本　太, “リチウム二次電池電極用バインダーにおける高電圧化への適用・評価と電極板製造工程での不良低減・安全性向上のポイント “,株式会社AndTech主催(東京，千代田区), 2016. 3. 25. (122) 田邉 豊和, 亀岡 聡, 郡司 貴雄, 金子 信吾, 蔡 安邦, 松本 太, Cu3Au前駆体ナノポーラスAuにおける残留Cu状態解析, 日本金属学会2015年度春期講演大会, 東京大学駒場キャンパス, 2015. 3.19. (121) 加藤　めぐみ, 南齋　勉, 井川　学, 松本　太, 油滴の自発的走行に及ぼす界面活性剤の影響, 第24回 非線形反応と協同現象研究会, 東京電機大学　東京千住キャンパス, 2014.12. 6. (120) Arockiam John Jeevagan, Takashi Tsuda, Govindachetty Saravanan, Takao Gunji, Masanari Hasimoto, Shingo Kaneko, Masahiro Miyauchi, Futoshi Matsumoto, Visible Light Driven Decomposition of Organic Compounds by Two Different CoCatalysts, 225nd Meeting of ECS, Orlando, USA, 2014.5, 12-16. 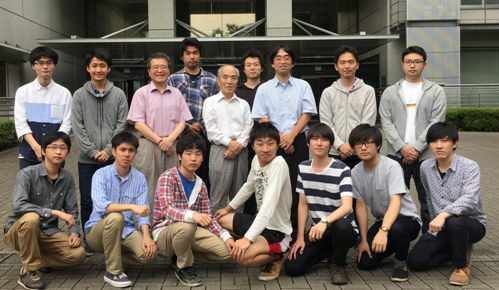 (119) Masanari Hasimoto, Arockiam John Jeevagan, Takashi Tsuda, Govindachetty Saravanan, Takao, Gunji, Shingo Kaneko, Masahiro Miyauchi, Futoshi Matsumoto, Photocatalytic Activity of Pt3Ti/WO3 Photocatalyst Under Visible-Light Irradiation, 225nd Meeting of ECS, Orlando, USA, 2014.5, 12-16. (118) B. Nanzai, M. Kato, Y. Okawa, M. Igawa, F. Matsumoto "Spontaneous motion of oil droplet in aqueous solution: Effect of contact angle and interfacial tensions under various conditions" P4 Gordon Research Conference 2014：Oscillations & Dynamic Instabilities in Chemical Systems (July 2014, Girona, Spain). (117) 岸岡真也，大園裕也，渡邊庄元，松本 太，��田 伶子，鈴木 優季子,芳香族ジアミン類縁体のAu(111)での電解重合:構造と酸素還元触媒反応, 2014年電気化学秋季大会, 北海道大学, 2014.9.28-29. (116) 田邉豊和, Manikandan Maidhily, 梅澤直人, 松本　太, 阿部英樹, 可視光水分解反応を指向した混合価数Sn3O4光触媒の開発, 2014年電気化学秋季大会, 北海道大学, 2014.8.28-29. (115) 松本　太, 若尾駿志, 望月康正, 金子信悟, 渡辺充広, 馬場邦人, 村上更,大村雅也, 神田雄介, 粗面化アルミニウム集電体を用いたリチウム二次電池用正極/水系バインダー薄膜性能評価, 2014年電気化学秋季大会, 北海道大学, 2014.9.28-29. (114) Arockiam John Jeevagan, Takao Gunji, Toyokazu Tanabe, Shingo Kaneko, Futoshi Matsumoto, Pd3Pb Ordered Intermetallic Catalyst for Improved Electrocatalytic Oxygen Reduction Reaction in Alkaline Environment, 2014年電気化学秋季大会, 北海道大学, 2014.9.28-29. (113) 郡司貴雄,坂井啓介,鈴木優季子,田邉豊和,金子信悟,松本太, 種々の金属酸化物に担持した白金系金属間化合物ナノ粒子の電極触媒活性, 2014年電気化学秋季大会, 北海道大学, 2014.9.28-29. (112) 郡司貴雄，臼井 将，金子信悟，田邉豊和，松本 太, Pt3Pbコア-PtPbシェル構造を有するナノ粒子の合成と触媒表面構造と燃料電池用電極触媒活性の関係, 表面技術協会第130回講演大会, 京都大学, 2014.9.22-23. (111) 松本 太，葛岡拓也，小山朋大，金子信悟，田邉豊和, 電気化学反応・酵素反応を用いたマイクロ自律移動体の開発, 表面技術協会第130回講演大会, 京都大学, 2014.9.22-23. (110) 郡司貴雄, 田邉豊和，金子信悟，松本 太, 金属酸化物担持白金系金属間化合物の燃料電池用電極触媒への適用, 電気化学会関東支部第32回夏の学校, 八王子セミナーハウス, 2014.8.28-29. (109) 橋本真成, 田邉豊和，金子信悟，松本 太, 白金系金属間化合物を助触媒とした光触媒の合成と光触媒活性の評価, 電気化学会関東支部第32回夏の学校, 八王子セミナーハウス, 2014.8.28-29. (108) Y. Sato, S. KANEKO, F. MATSUMOTO, B. XIA, Q. ZHANG, G. FANG, W. LIU, H. SUN, J. ZHENG and D.Li, High Rate Capability of Lithium-Rich Layered Li1.2Ni0.18Mn0.59Co0.03O2 Cathode Material Prepared from Size-Regulated Precursor Fine Particles, 10th IUPAC International Conference on Novel Materials and Their Synthesis, 鄭州, 中国, 2014.10.11-15. (107) T. Gunji, K. Sasaki, A. J. Jeevagan, T. Tanabe, S. Kaneko and F. Matsumoto, Enhanced Oxygen Reduction Reaction and Stable Long-Term Activity on TiO2-supported Dealloyed PtCu Nanoparticles in Acidic Aqueous Solutions, 第24回日本MRS年次大会, 横浜開港記念会館, 2014.12.10-12. (106) A. J. Jeevagan, T. Gunji, M. Hashimoto, T. Tanabe, S. Kaneko, and F. Matsumoto, Synthesis of Pt and Pd Based Intermetallic and Bimetallic Nanoparticles on Semiconductors and Their Photocatalytic Activity, 第24回日本MRS年次大会, 横浜開港記念会館, 2014.12.10-12. (105) 郡司貴雄，田邉 豊和，金子 信悟，松本 太, Pt系金属間化合物を用いた固体高分子形燃料電池用高性能電極触媒の開発, 4th CSJ Chemistry Festa, タワーホール船堀, 2014.10.14-16. (104) 郡司貴雄，大場匠悟，田邉豊和，金子信悟，松本 太, マイクロ波ポリオール2段階法を用いたPt3Pbコア-PtPbシェル構造を有するナノ粒子の合成と電極触媒活性の向上, 平成26年度神奈川県ものづくり技術交流会, 神奈川県産業技術センター, 2014.10.23. (103) A. J. Jeevagan, T. Gunji, M. Hashimoto), S. Kaneko, F. Matsumoto, Synthesis of Pd-Based Nanoparticles and Its Photocatalytic Activity for Organic Compounds Decomposition, 226nd Meeting of ECS, Cancun, Mexico, 2014.10, 5-10. (102) A. J. Jeevagan, T. Gunji, M. Hashimoto, S. Kaneko, M. Tanaka, and F. Matsumoto, Synthesis of Reduced Graphene Oxides-Supported Binary Catalysts and Its Electrocatalytic Activity, 226nd Meeting of ECS, Cancun, Mexico, 2014.10, 5-10. (101) T. Tanabe, T. Gunji, K. Sasaki, A. J. Jeevagan, T. Tsuda, S. Kaneko, G. Saravanan, H. Abe, M. Tanaka and F. Matsumoto, Enhancement of Electrocatalytic Activity for Oxygen Reduction Reaction on TiO2-Supported Pt-Based Intermetallic Compound Catalysts, 226nd Meeting of ECS, Cancun, Mexico, 2014.10, 5-10. (100) A. J. Jeevagan, T. Gunji, T. Tanabe, S. Usui, T. Tsuda, S. Kaneko, G. Saravanan, H. Abe, M. Tanaka and F. Matsumoto, Enhancing Alkaline Ethanol Oxidation on Ordered Intermetallic Pt3pb-Ptpb Core-Shell Nanoparticles Prepared by Converting Nanocrystalline Metals to Ordered Intermetallic Compounds, 226nd Meeting of ECS, Cancun, Mexico, 2014.10, 5-10. (99) 松本 太, 小瀬村 峻也, 井戸 功二, 望月 康正, 田邉 豊和, 金子 信吾, 鵜川 晋作, イ ホジン, 高電圧・高容量 Li 過剰系固溶体正極材料への水系バインダーの適用と性能評価, 第55回電池討論会, 国立京都国際会館, 2014.11.21. (98) 渡辺 司, 田中 学, 望月 康正, 松本 太, 川上 浩良, 全固体型リチウムイオン電池の電解質応用を目指したイオン伝導性高分子ナノファイバーの作製, 第55回電池討論会, 国立京都国際会館, 2014.11.21. (97) 橋本真成, 田邉豊和, 宮内雅浩, 阿部英樹, 郡司貴雄, 松本太, 金属間化合物を助触媒とした光触媒による CO2還元反応, 第21回シンポジウム「光触媒反応の最近の展開」, 東京大学生産技術研究所コンベンションホール, 2014.12.12. (96) 松本　太，方　雪琴，金子信悟，佐藤静夏，田邉豊和, AlCl3-EMICイオン液体からのアルミニウム電気めっきにおける添加剤の効果, 表面技術協会第131回講演大会, 関東学院大学, 2015.3.4-5. (95) 葛岡拓也，小山朋大，金子信悟，田邉豊和，南齋　勉，松本　太, 酵素反応を用いたマイクロ自立移動体の開発(2), 表面技術協会第131回講演大会, 関東学院大学, 2015.3.4-5. (94) 小瀬村俊也，大場匠悟，金子信悟，望月康正，田邉豊和，松本　太，鵜川晋作，イホジン, 高電圧・高容量Li過剰系固溶体正極材料への水系バインダーの適用と電池性能の向上, 表面技術協会第131回講演大会, 関東学院大学, 2015.3.4-5. (93) 伊藤拳人，森田千絵，金子信悟，田邉豊和，松本　太, Cu/Ni多層めっきにおけるめっき層の構造と耐摩耗性の関係, 表面技術協会第131回講演大会, 関東学院大学, 2015.3.4-5. (92) 小林拳人，金子信悟，川上博司，齋藤美和，田邉豊和，松本　太, 湿式法により作製したフレキシブル熱電材料の熱電変換特性, 表面技術協会第131回講演大会, 関東学院大学, 2015.3.4-5. (91) 松本　太，小瀬村 峻也，井戸 功二，大場　匠悟，望月 康正，田邉 豊和，金子 信悟鵜川 晋作，イ ホジン, 水系バインダー/種々の増粘剤を用いて作製した高電圧・高容量Li過剰系固溶体系正極の電池特性, 電気化学会第82回大会, 横浜国立大学, 2015.3.15-17. (90) 田邉 豊和, 宮澤 亘, ジョン ディーバガン アロキン, 郡司 貴雄, 金子 信悟, 宮内 雅浩,松本 太, Pt-Pb合金微粒子担持ルチル型TiO2ナノロッド光触媒の合成及び助触媒担持法の違いによる酢酸の光酸化分解活性への影響, 電気化学会第82回大会, 横浜国立大学, 2015.3.15-17. (89) ジョン ディーバガン アキロン, 田邉 豊和, 郡司 貴雄, 金子 信吾, 梅澤 直人, 阿部 英樹, 松本 太, 可視光応答型Sn3O4光触媒粉末における助触媒担持効果と犠牲剤水溶液からの水素生成, 電気化学会第82回大会, 横浜国立大学, 2015.3.15-17. (88) 郡司 貴雄,田邉 豊和,金子 信悟, 松本 太, 種々の金属酸化物に担持した白金系金属間化合物ナノ粒子のORR触媒活性, 電気化学会第82回大会, 横浜国立大学, 2015.3.15-17. (86) 松本　太, 固体/溶液界面における電子移動反応を利用したエネルギー変換〜研究機関の役割と共同研究〜, 古河電工株式会社, 2014.10.22. (85) 松本 太, Pt系金属間化合物の固体高分子形燃料電池用電極触媒への適用, 大学／産技センター連携「電気化学応用エネルギー技術フォーラム」平成26年度神奈川県ものづくり技術交流会, 神奈川県産業技術センター, 2014.10.23. (84) 松本 太, Pt系金属間化合物の固体高分子形燃料電池用電極触媒への適用,名古屋カンファレンス「未来を動かす電子移動化学」日本化学会東海支部, 名古屋工業大学, 2014.12.12. (83) 松本　太, Pt系金属間化合物の固体高分子形燃料電池用電極触媒への適用,電気化学会関東支部サイエンスレクチャー, 電気化学会(市ヶ谷), 2015.2.10. (82) 松本　太, 固体/溶液界面における電子移動反応を利用したエネルギー変換, JSR株式会社先端材料研究所, 2015.3.6. (81) Genki Kobayashi, Yuta Irii, Futoshi Matsumoto, Atsushi Ito, Shinji Yamamoto, Masaharu Hatano, Yuichi Sato, Surface and Bulk Structures of Li-Rich Layered Oxides, xLiMO2 – (1-x)Li2MnO3, Coated with Al2O3, The 64th Annual Meeting of the International Society of Electrochemistry(Santiago de Querétaro, Mexico, 2013.9.8-13). (80) Yuichi Sato, Genki Kobayashi, Yuta Irii, Nobuya Kitada, Futoshi Matsumoto, Ryo Ohtsu, Kohei Shibukawa, Atsushi Ito, Shinji Yamamoto, Yasuhiko Ohsawa, Surface Modification Effect on Electrochemical Performance of Li-rich Layered xLi2MnO3-(1-x)LiMO2, The 64th Annual Meeting of the International Society of Electrochemistry(Santiago de Querétaro, Mexico, 2013.9.8-13). (79) Arokim John Jeevagan, 郡司貴雄,臼井将, Govindachetty Saravanan, 津田喬史,金子信悟,小林玄器,松本太，Methanol and Ethanol Oxidation on Ordered Intermetallic Compounds in Alkaline Media(電気化学会2013年度秋季大会), 東京工業大学, 2013.9.27-28. (78) 松本太, 鈴木優季子, 村越恵理香, 斧淵俊明, Govindachetty Saravanan, Arokim John Jeevagan, 金子信悟, 小林玄器，遷移金属イオンをドープしたマンガン酸化物の空気電池用空気極触媒への適用(電気化学会2013年度秋季大会), 東京工業大学, 2013.9.27-28. (77) 小林玄器,渡邉明尋,松本太,佐藤祐一, Li過剰系正極Li[Li0.2Ni0.18+xCo0.03Mn0.58-x]02の充放電挙動と電極特性(電気化学会2013年度秋季大会), 東京工業大学, 2013.9.27-28. (76) 郡司貴雄, Govindachetty Saravanan, 臼井将, Arokim John Jeevagan, 津田喬史, 金子信悟, 小林玄器, 松本太, 金属間化合物の固体高分子型燃料電池用カソード電極触媒としての適用(電気化学会2013年度秋季大会), 東京工業大学, 2013.9.27-28. (75) 津田喬史，Govindachetty Saravanan，橋本真成，Arokim John Jeevagan，郡司貴雄，金子信悟，小林玄器，松本太,金属間化合物助触媒/光触媒の合成と触媒特性(電気化学会2013年度秋季大会), 東京工業大学, 2013.9.27-28. (74) 松本 太，井澤圭介， 金子信悟， 持田由幸， Govindachetty Saravanan，Arockiam John Jeevagan，木村元彦，小林玄器，佐藤祐一, Ni/Cu多層膜の耐摩耗性の膜厚依存性および中間層の影響(表面技術協会第128回講演大会)，福岡工業大学，2013.9.24-25. (73) Takao Gunji, Govindachetty Saravanan, Shingo Kaneko, Genki Kobayashi, Futoshi Matsumoto,,Enhanced Catalytic Oxygen Reduction Performance from Titania Supported PtPb Nanoparticles, 224nd Meeting of ECS, San Francisco, 2013.10, 27-11.1. (72) Arockiam John Jeevagan, Govindachetty Saravanan, Toshiaki Onobuchi,Yukiko Suzuki, Erika Murakoshi, Shingo Kaneko, Genki Kobayashi, Futoshi Matsumoto , Electrocatalytic Oxygen Reduction and Water-Oxidation on Transition Metal Ions-Doped MnO2, RuO2 and IrO2 in Alkaline Aqueous Solutions, 224nd Meeting of ECS, San Francisco, 2013.10, 27-11.1. (71) Takashi Tsuda, Govindachetty Saravanan, Arockiam John Jeevagan , Masanari Hashimoto, Shingo Kaneko, Genki Kobayashi, Futoshi Matsumoto, Synthesis of Intermetallic Nanoparticles as Co-catalyst on Anatase TiO2 and Its Photocatalytic Activity, 224nd Meeting of ECS, San Francisco, 2013.10, 27-11.1. (70) Toshiaki Wakao, Yasumasa Mochizuki, Govindachetty Saravanan, Arockiam John Jeevagan, Kunihito Baba, Mitsuhiro Watanabe, Yusuke Kanda, Koh Murakami, Masaya Omura, Genki Kobayashi, Futoshi Matsumoto, Stable Charge/Discharge Cycle Performance of LiFePO4 Cathode Prepared with Carboxymethly Cellulose Binder, 224nd Meeting of ECS, San Francisco, 2013.10, 27-11.1. (69) Arockiam John Jeevagan, Naoyuki Sawano, Govindachetty Saravanan, Takao Gunji, Shou Usui, Taiki Kojima, Shingo Kaneko, Genki Kobayashi, Futoshi Matsumoto, Two-step Microwave Synthesis of Highly Dispersed Ordered Intermetallic PtPb Nanoparticles on Carbon Black, 224nd Meeting of ECS, San Francisco, 2013.10, 27-11.1. (68) 津田喬史, 橋本真成, Arockiam John Jeevagan, 郡司貴雄, 金子信悟, 宮内雅浩, 松本　太, 金属間化合物ナノ粒子助触媒/WO3光触媒の合成と触媒特性(第20回記念シンポジウム「光触媒反応の最近の展開」)，東京大学生産技術研究所コンベンションホール，2013.12.13. (67) 松本　太, 郡司貴雄, FC EXPO 2014, 金属間化合物ナノ粒子の固体高分子形燃料電池用電極触媒への適用，東京ビックサイト，2014.2.26-28. (66) 松本　太，津田喬史，橋本真成，Arockiam John Jeevagan，金子信悟2，宮内雅浩, PtPb金属間化合物助触媒/WO3光触媒の合成と触媒特性, 表面技術協会第129回講演大会，東京理科大学野田キャンパス，2014.3.13-14. (65) 松本　太，若尾駿志, 望月康正, 金子信悟, 渡辺充広, 馬場邦人, 神田雄介, 大村雅也, 村上　更, 粗面化アルミニウム集電体を用いたリチウム二次電池用正極/水系バインダー薄膜の作製と性能評価, 表面技術協会第129回講演大会，東京理科大学野田キャンパス，2014.3.13-14. (64) 佐藤　静夏, 藤井大地, 金子信悟，松本　太, アルミニウム電気めっき膜の陽極酸化による規則性ポーラス構造の作製, 表面技術協会第129回講演大会，東京理科大学野田キャンパス，2014.3.13-14. (62) 森田千絵, 井澤圭介, 金子信悟，佐藤祐一,松本　太，Ni/Cu多層膜におけるCuおよびNi層の結晶性と耐摩耗性の関係, 表面技術協会第129回講演大会，東京理科大学野田キャンパス，2014.3.13-14. (61) 横溝美衣子, 金子信悟, 望月康正，嵐田敏彦, 笹元貴弘, 松本　太，スパッタリング法を用いたリチウムイオン伝導固体電解質リン酸リチウムオキシナイトライド（LiPON）薄膜の作製と性能評価, 表面技術協会第129回講演大会，東京理科大学野田キャンパス，2014.3.13-14. (60) 橋本 真成, 津田 喬史, 郡司 貴雄, Arockiam John Jeevagan, 金子 信悟, 松本 太, 白金系金属間化合物を助触媒とした光触媒の合成と光触媒活性の評価(2), 電気化学会第81回大会，関西大学, 2014.3.29-31. (59) 郡司 貴雄, 津田 喬史, Arockiam John Jeevagan, 金子 信悟, 松本 太, 金属酸化物担持白金系金属間化合物の燃料電池用酸素極触媒への適用, 電気化学会第81回大会，関西大学, 2014.3.29-31. (58) 郡司 貴雄, 佐々木 謙悟, 津田 喬史, Arockiam John Jeevagan, 金子 信悟, 松本 太, 酸化チタン担持白金系合金触媒を用いた酸素還元特性の向上, 電気化学会第81回大会，関西大学, 2014.3.29-31. (57) 鈴木優季子, 坂井啓介, 入井友海太，郡司貴雄, 津田喬史, Arockiam John Jeevagan, 金子信悟, 松本 太, 空気電池用空気極触媒としてのカーボン担持高分散金属酸化物の合成とBifunctional 特性, 電気化学会第81回大会，関西大学, 2014.3.29-31. (56) 金子信悟, Bingbo Xia, 松本 太, 佐藤祐一, Junwei Zheng, Decheng Li, 高レート特性を発揮するリチウム過剰層状正極材料のサイズ制御前駆体に基づく合成, 電気化学会第81回大会，関西大学, 2014.3.29-31. (55) 郡司 貴雄, 臼井 将, 津田 喬史, Arockiam John Jeevagan, 金子 信悟, 松本 太, マイクロ波ポリオール2段階法を用いた Pt3Pb コア-PtPb シェル構造を有する ナノ粒子の合成と電極触媒活性の向上, 電気化学会第81回大会，関西大学, 2014.3.29-31. (54) 郡司 貴雄, 津田 喬史, Arockiam John Jeevagan, 金子 信悟, 松本 太, マイクロ波ポリオール 2段階法を用いて 調製したPt系金属間化合物の電極触媒特性, 電気化学会第81回大会，関西大学, 2014.3.29-31. (53) 岸岡真也，大園裕也，渡邊庄元，松本 太，��田 伶子，鈴木 優季子, 芳香族ジアミン類のAu(111)での電解重合：構造と酸素還元触媒反応, 電気化学会第81回大会，関西大学, 2014.3.29-31. (50)松本　太， “機能性ナノ粒子を用いた新しいエネルギー変換材料の創出“, 神大テクノフェスタ, (神奈川大学),2013.12.6. (49) Genki Kobayashi, Kohei Shibukawa, Yuta Irii, Futoshi Matsumoto, Atsushi Ito,Yasuhiko Ohsawa, Masaharu Hatano, and Yuichi Sato, Surface Coating Effect on Electrochemical Performance of Li-Rich Layered Li[Li0.2Ni0.18Co0.03Mn0.58]O2, (Poster) IMLB 2012, Korea, Jeju, 2012.6.19. (48) Y. Irii, G. Kobayashi, T. Kataoka, T. Ikehara, F. Matsumoto, A. Ito, Y. Ohsawa, M. Hatano, and Y. Sato, Study on Phase Diagram of Li-Rich Layered Li[Li0.2Ni0.18Co0.03Mn0.58]O2 (Poster), PRiME 2012(222nd Meeting of ECS), Hawaii, 2012.10, 8. (47) K. Izawa, F. Matsumoto, M. Kimura, M. Fukunishi, G. Kobayashi and Y. Sato, The Wear Resistance Property of Cu/Ni Multilayer Films Prepared by Electrodeposition in Single and Dual Baths, IUMRS-International Conference on Electronic Materials (IUMRS-ICEM 2012), Pacifico Yokaohama, Yokohama, 2012.9.23-28. (46) F. Matsumoto and H. Abe, Application of Ordered Intermetallic Phases to Electrocatalysis, IUMRS-International Conference on Electronic Materials (IUMRS-ICEM 2012), Pacifico Yokaohama, Yokohama, 2012.9.23-28. (45) Yuichi Sato, Atsushi Ito, Masaharu Hatano, Hideaki Horie, Yasuhiko Ohsawa,Genki Kobayashi , Futoshi Matsumoto, RETENTION OF HIGH CAPACITIES OF A LI-RICH SOLID SOLUTION LAYERED CATHODE MATERALS (Li2MnO3–LiMO2) FOR LI-ION SECONDARY BATTERIES VIA ELECTROCHEMICAL PRE-TREATMENT, IUPAC 8th International Conference on Novel Materials and Synthesis (NMS-VIII) & 22nd International Symposium on Fine Chemistry and Functional Polymers (FCFP-XXII), Xi’An, 2012.10.14-19. (44) 小林玄器，入井友海太，北田暢也，大津　諒，渋川晃平，松本　太，伊藤淳史，大澤康彦，山本伸司，佐藤祐, 酸化物表面修飾を施したリチウム過剰系正極xLi2MnO3-(1-x)LiMO2の電気化学特性 (第53回電池討論会), ヒルトン福岡シーホーク, 2012.11.14-16. (43) 小林玄器, 入井友海太, 北田暢也, 松本　太, 伊藤淳史, 山本伸司, 秦野正治, 佐藤祐一, リチウム過剰系正極材料における表面修飾の効果(電気化学会第80回大会), 東北大学, 2013.3.29-31. (42) 斧淵俊明, Govindachetty Saravanan, 小林玄器, 松本　太, 種々の遷移金属をドープしたマンガン酸化物の合成と空気電池用酸素極触媒への適用, (電気化学会第80回大会), 東北大学, 2013.3.29-31. (41) 津田喬史, GovindachettySaravanan, 小林玄器, 松本　太, 白金系金属間化合物担持光触媒の合成(電気化学会第80回大会), 東北大学, 2013.3.29-31. (40) 井澤圭介, 木村元彦, 福西美香, 小林玄器, 佐藤祐一, 松本 太, Cu／Ni 多層めっき膜における耐摩耗性向上およびナノ周期パターンの制御（表面技術協会第127回講演大会）, 日本工業大学，2013.3.18-19. (39) 森田雄二, 河野智洋, 小林玄器, 佐藤祐一, 松本 太, 電気化学反応を用いたマイクロ自立移動体の開発（表面技術協会第127回講演大会）, 日本工業大学，2013.3.18-19. (36) ＜国際学会招待講演＞Futoshi Matsumoto, Hideki Abe, Application of Ordered Intermetallic Phases to Electrocatalysis, PRiME 2012(222nd Meeting of ECS), Hawaii, 2012, 10, 9. (30) 松本　太，“リチウムイオン２次電池におけるシリコン負極材を利用した電極の特性とバインダー”、「リチウム二次電池におけるシリコン系負極の結着性向上技術 〜バインダーの分散、劣化機構/集電銅箔の表面処理／電極剥離対策〜」、技術情報協会セミナー(東京、大井町), 2013.3.27. (27) 松本　太, 阿部秀樹，紀之定 壮大，五十嵐優也, 有機分子の酸化および酸素分子の還元反応における電極触媒Pt3Ti金属間化合物ナノ粒子の検討, 2011年電気化学秋季大会(朱鷺メッセ・新潟コンベンションセンター), 2011.9.9. (25) F. Matsumoto, H. Abe, S. Kinosada, Preparation and Characterization of Carbon-supported Ordered Intermetallic Pt3Ti Nanoparticles for the Oxygen Reduction in PEFCs, Electrochemical Society, 220th ECS Meeting(Westin Boston Waterfront and the Boston Convention and Exhibition Center), 2011.10.10. (24) A. Watanabe, F. Matsumoto, G. Kobayashi, M. Fukunishi, Y. Sato, A. Ito, Y. Ohsawa, Relationship between Electrochemical Pre-Treatment and Cycle Performance on Li-Rich Solid-Solution Layered Li[Ni0.18Li0.20Co0.03Mn0.58]O2 Cathode Materials for Li-Ion Secondary Battery, Electrochemical Society, 220th ECS Meeting(Westin Boston Waterfront and the Boston Convention and Exhibition Center), 2011.10.10. (23) 松本　太，渡邉明尋，佐藤祐一，小林玄器，伊藤淳史，大澤康彦，秦野正治，固溶体系正極材料Li[Ni0.18Li0.20Co0.03Mn0.58]O2 における電気化学段階的前処理条件と充放電特性の関係，第52回電池討論会（タワーホール船堀）, 2011.10.17-20. (22) 松本　太, 阿部秀樹，紀之定 壮大，小林玄器，金属間化合物を用いた固体高分子形燃料電池用電極触媒の開発, 第52回電池討論会（タワーホール船堀）, 2011.10.17-20. (21) 伊藤淳史, 蕪木智裕, 大澤康彦, 渡邉学, 真田貴志, 千葉啓貴, 秦野正治, 堀江英明, 松本太, 佐藤祐一, 高容量電池用固溶体正極の電気化学特性, 第52回電池討論会（タワーホール船堀）, 2011.10.17-20. (20) 木村元彦, 松本　太, 福西美香, 小林玄器, 佐藤祐一, Cu/Ni多層膜の耐摩耗性の向上における中間層の効果, 表面技術協会第125回講演大会(東京都市大学), 2012.3.13-14. (19) 河野 智洋, 松本 太,小林 玄器, 電気化学反応を利用した自立型移動体（マイクロマシーン）の開発, 電気化学会第79回大会,(アクトシティ浜松), 2012.3.29-31. (18) 松本 太, 市村 尚之, 小林 玄器, 固体高分子形燃料電池用アノード触媒としての白金系金属間化合物の高電位状態での安定性, 電気化学会第79回大会,(アクトシティ浜松), 2012.3.29-31. (17) 小林玄器，渋川晃平，入井友海太，松本 太，佐藤祐一，伊藤敦史，秦野正治，大澤康彦, 酸化物コーティングを施したLi過剰系固溶体正極Li[Li0.2Ni0.183Co0.03Mn0.583]O2の電極特性, 電気化学会第79回大会,(アクトシティ浜松), 2012.3.29-31. (15)　松本　太, 金属間化合物の電極触媒への応用, 2011年電気化学秋季大会(朱鷺メッセ・新潟コンベンションセンター), 2011.9.9. (12) 松本　太，CMC・アクリル酸バインダーの特徴と電池特性に及ぼす影響,「リチウムイオン電池バインダーの設計・調整および分析・評価手法」セミナー,サイエンス&テクノロジー（東京, 東京流通センター）, 2012.1.26. (10) 福西美香，松本　太，佐藤祐一，一浴法，二浴法によるCu/Niナノオーダー多層めっき膜の耐摩耗性，表面技術協会，第122回講演大会(東北大学), 2010. 9. 5. (9)	M. Fukunishi, F. Matsumoto, Y. Sato, The Influence of Impurities of Cu/Ni Multilayers Prepared by Electrodeposition in Single and Dual Baths on Wear Resistance，MRS-J, 20th MRS-Japan Academic Symposium (Yokohama Media & Communications Center), 2010.12.20. (8)	Y. Irii, F. Matsumoto, Y. Sato, Y. Ohsawa, A. Ito, Improvement of the Thermal Stability and High Rate Cycle Performance of Li[Ni0.18-xLi0.20Co0.03-yMn0.58-zMx+y+z]O2 Cathode of Li-ion Battery by Metal Substitution，MRS-J, 20th MRS-Japan Academic Symposium (Yokohama Media & Communications Center), 2010.12.20. (7)	A. Watanabe, F. Matsumoto, Y. Sato, Y. Ohsawa, A. Ito, Effect of Electrochemical Pretreatment on Battery Performance of Li[Ni0.18Li0.20Co0.03Mn0.58]O2 Cathode Materials for Li-ion Battery (I)，MRS-J, 20th MRS-Japan Academic Symposium (Yokohama Media & Communications Center), 2010.12.20. (4)	松本　太, 阿部秀樹，紀之定 壮大，Pt3Ti金属間化合物を用いた固体高分子形燃料電池用電極触媒の開発，,電気化学会第78回大会(横浜国立大学), 2011.3.29. (8) 渡邉明尋，松本　太，佐藤祐一，大澤康彦， 伊藤淳史，リチウムイオン二次電池用固溶体正極活物質Li[Ni0.18Li0.20Co0.03Mn0.58]O2における電気化学段階的前処理と充放電特性の関係，電気化学会第78回大会(横浜国立大学), 2011.3.29. (3) 北田暢也，入井友海太，松本　太，佐藤祐一，大澤康彦， 伊藤淳史，リチウムイオン二次電池用固溶体正極活物質Li[Ni0.18Li0.20Co0.03Mn0.58]O2のレート特性の向上，電気化学会第78回大会(横浜国立大学), 2011.3.29. (2)福西美香，河野琢磨，松本　太，佐藤祐一，CMCバインダーを用いたリチウムイオン二次電池用シリコンアノードにおける充放電特性のアノード被膜形態，表面技術協会第123回講演大会(関東学院大学), 2011. 3. 17.